I dont know if I’ll have enough time, but I cant resist this one. 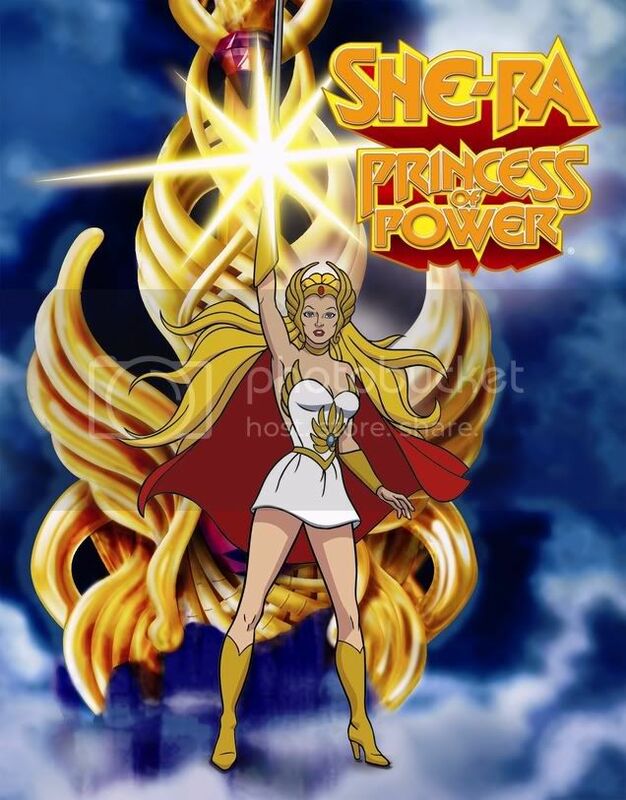 I’ll tackle She-Ra: Princess of Power. PS: I was also thinking about “Meatballs and Spagetti”, but couldnt really find enough references so far. i thought about doing her, aswell. because i want more female characters in my portfolio, but then i decided to go with my first hunch. good luck. i’m looking forward to see what you come up with. Thanks, Rasmus. I’ll try not to dissapoint. I decided against a sculpting-retopo workflow in favor of a more traditional modeling approach and here’s how far I got in Maya with the help of Nex in about 3 hours. Alrighty, I know she aint much to look at yet, but I’m not really concerned with cosmetic appearance at this point. I’m still working out the proportions and loop-flow and will try to get somewhere in the range of 5k polys with the next detail pass before I’ll take her into UVLayout and then Mudbox. Any and all comments welcome as usual. UVLAYOUT for the win!!! - I love how you can get done in an hour what used to take a day. Thanks for the comment, Joel. Yeah, UVLayout is a real winner. I would’ve gone crazy without it by now or resorted to constantly using AUV tiles. Okay, I really should not work this way, as I always end up wasting massive amounts of time tweaking stuff in Maya that would be so much faster in MB or ZB. Damn, 8 hours total on this and I still havent sculpted a single poly. I could be almost done with the secondary details by now. 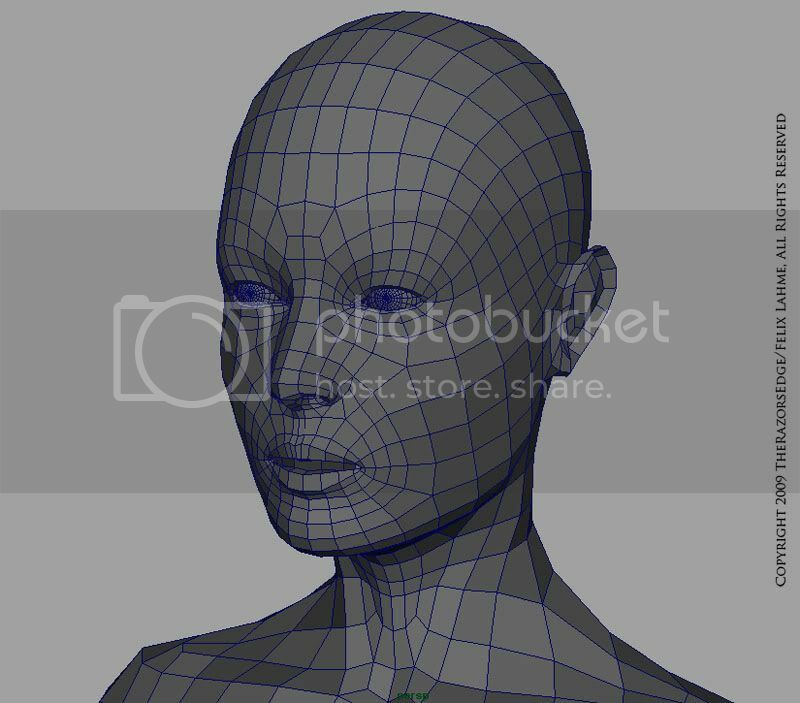 But boy, do I hate retopo-work. lol Anyways, after 4-5 hours on the detail pass and some posing, here’s what I got so far for the finished base. She’s still not much of a looker, but come Mudbox time, that will hopefully change. 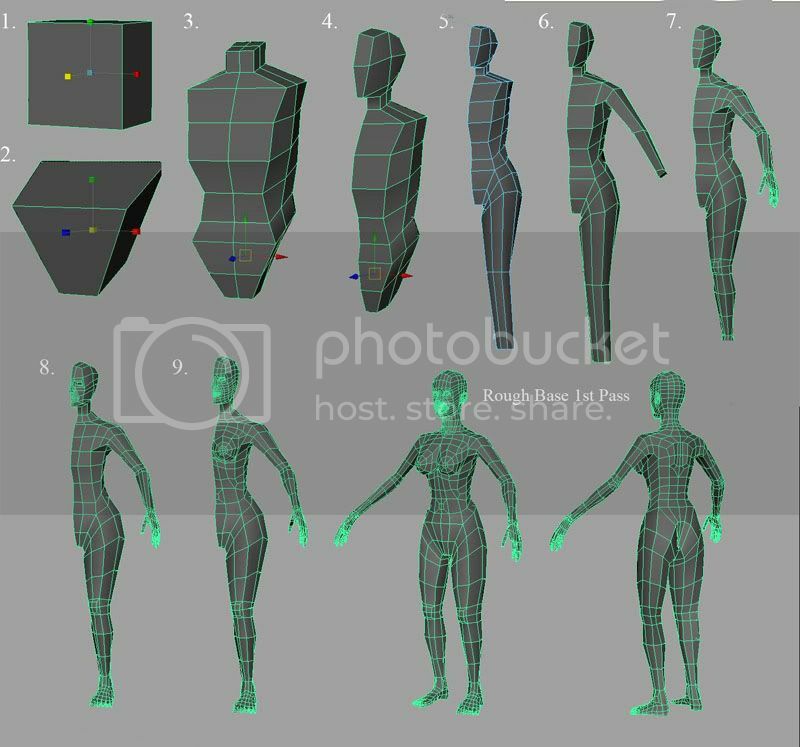 Alright, I tentatively finished the first sculpting pass for the silhouette in Mudbox, then took the base back into Maya to fix some topology that wasnt subdividing as smoothly as I wanted or was causing me some other issues in regards to flow etc and got rid of some faces that proved unnecessary to begin with. Here’s what I got so far. Looks good, nice clean mesh. Maybe her hands are a tad too thin? The proportions are looking very good as well! Are you using any likeness? are you going for the imaginative approach? 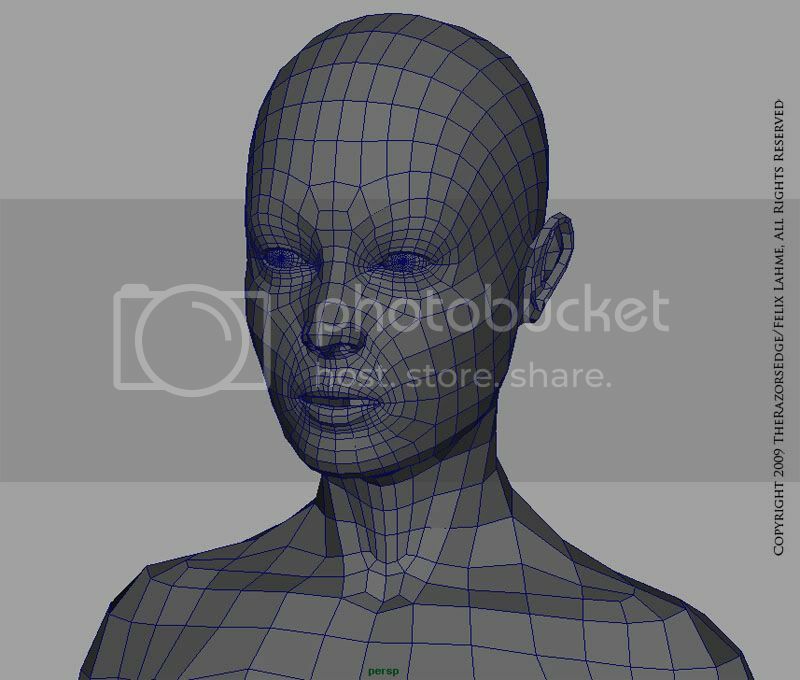 Looking like a nice clean mesh, any chance of a zoomed up version of the face? delavega: You’re right about the hands. They’re lacking thickness, especially in the palm/thumb area. I’ll get on that right away. Thanks for the crit and comment! leviathon: Many thanks for the compliments on the mesh. I’m still undecided who to use for likeness, but am strongly considering Catherine Heigl, with a bit more buff physique. As far as overall interpretation goes I’ll go for the classic look first and will then see what I can add to make it look more up-to-date. It’s most likely going to be a new/original interpretation. samartin: Sure thing! I’ll get you a face-topo close-up with the next update. I haven’t had the time to continue working on this, but as requested here’s the close-up on the current facial base-topo. I’ll probably edit this some more along the way. base is looking great. very nice and clean. only got two crits for you. the ear-lobe looks a bit thin. think, this could cause problems when sculpting. last one i’m not really sure about. as far as i know, you should “always” try and get loops running around the neck. yours stop halfway and then follows the clavicle. anyway, keep it up. think it’s looking great. btw. can you post a closeup of the arm and leg? i think i would clean those loops a bit. Here’s the arms and legs as you wanted to take a look at more closely. I also added some loops on the eyes and changed the topology on the ears as suggested and while I was at it edited the nose quite a bit as well. Here’s the new topo. She’s weighing in at 5578 polys for the base now. In regards to the neck, I’m curious as to why exactly the topo should be done as you suggested. Most of the deformation originating from head movement happens right below the skull. The rest is just slight stretch and compress or follows the movement of the shoulders. Topo is always a tricky question as there are so many factors that can come into play depending on how the mesh is skinned etc. The toes look a little short and not quite stubby/chubby enough, judging that by the left foot. Does MB allow you to adjust the volume of the object!? I’m asking as you mention you haven’t done the hands yet and you mention it’s less painful to do in MB. Yeah, the feet need some work real bad. They’re not really a priority though, since she’s gonna be wearing her boots, but I’ll get them up to par anyways. In regards to your question, MB allows volume modification either on an object scale via the respective manipulator or via the “Bulge-Brush” (Inflat in ZB). Hope this answers your question. The pose in the above image could be a tad more dynamic, but that should not prove to be a huge issue, which the image below by Zephyri fixes neatly. PS: Also, I thought this one might be a nice find to share here. I belive the artists name is Nate Baertsch. Looking forward to see your result. Many thanks, kyrandian! I’ll update the picture posts right away. I’m Nate Baertsch… aka Baena on many other boards including this one. Felix, I’m loving what I’m seeing, thanks for your kind email. I’m very happy to see where you’ll take your 3D rendering! I agree with the others that have mentioned that the hands need work, they’re too thin, a little more form and plump in the pads of her palms would help greatly. Some help to on some of the artwork you couldn’t find who the artist was? 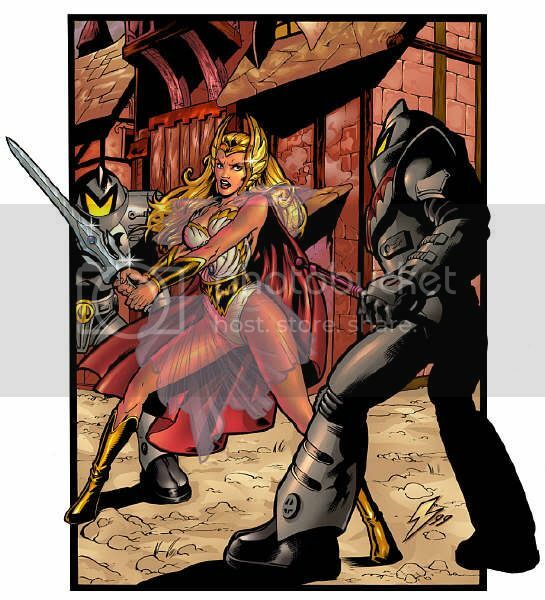 She-Ra with the Horde troopers there was done by Emiliano Santalucia, he worked on the 2002-2004 Masters of the Universe comic, he’s also done lots of work on the recent GI Joe comic and the Transformers comics. He’s a master of most things 80’s cartoon related. 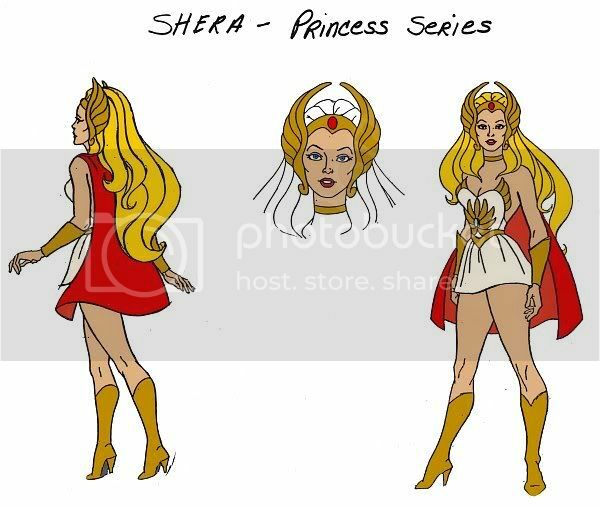 The other just looks like a model sheet or study on the Filmation design of She-Ra, I don’t know if it’s from Filmation or some fan that’s mimicing the style? Anyways, again, I look forward to seeing where this goes! 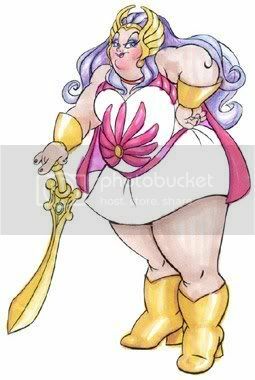 Oh and careful not to follow my art too closely, I did that a few years back, and well, she looks like her leg is broke in about three places! LOL! There’s a lot I’d fix on that today. looking good man, very nice build on her. I can’t wait to see what pose you put her in! Baena: Hey Nate, great to have you watching this! Many thanks for your input so far. It’s much appreciated. 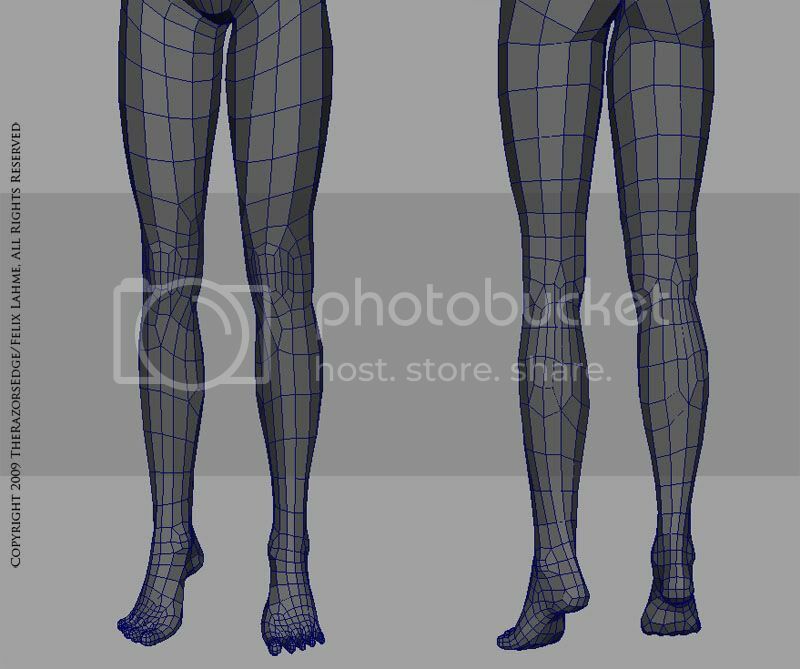 I’ll work those hands in Mudbox after I get the UV’s laid out and will keep those pointers about the leg in mind. Also, I updated the picture reference with the artist’s name as you suggested. Thanks for your help on that as well. The pose will be a variation of the classic pose already laid out by Nate and Sam Hogg. I think that’s most fitting, but will experiment some more come rigging time and am generally open to all other suggestions. Here’s another reference from the animated series. 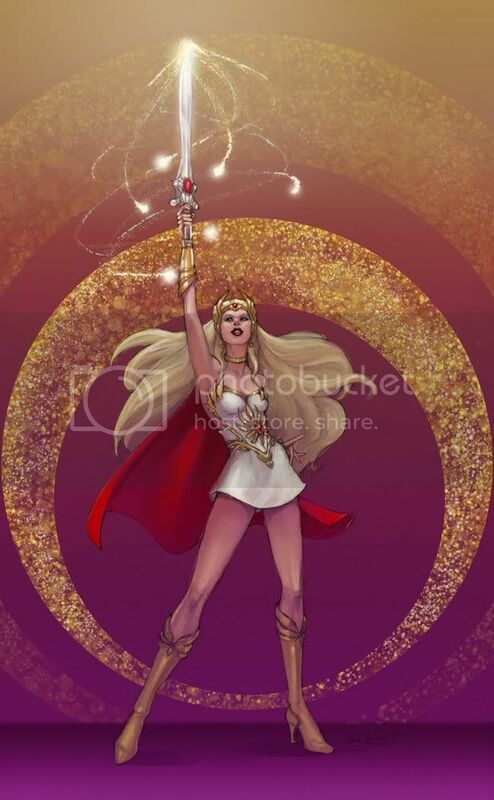 Think way more dynamic, showing off the awesome power she is invoking and that’s what I’ll try to do. I have to admit, I was very tempted to do this one though.